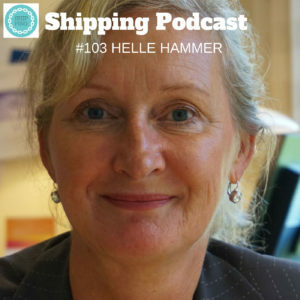 In episode 103, I finally got the chance to sit down and speak with Helle Hammer, Managing Director, CEFOR. Our paths have never crossed before, we just know each other through mutual friends in the marine insurance industry. I am happy that we got some time to speak about what it’s like to be a female role model, what a lobbyist do and why it’s so interesting with all the changes taking place right now. Listen to Helle and give your comments on what she is saying, do you agree? Are we in a paradigm when shipowners have started to open up and realise the value of being transparent and participate in the conversation around what the maritime industry contributes to global trade and the development of our future society? Thank you for listening! Spread the word about the @ShippingPodcast – it’s allowed!